Tracy Powers Caught a Big One! Tracy Powers, pictured with this 37-inch Tiber Dam northern pike that weighed 18 pounds, went ice fishing with her boyfriend, Brent Hamernick of Missoula, last week on Tiber, which is located northt of Great Falls. 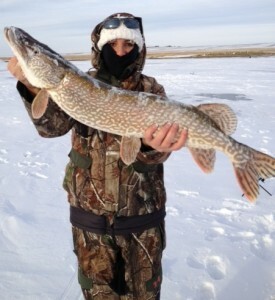 “We caught this nice northern using live minnows”, said Tracy in a text message. She also reported that the walleye fishing was good with some 4-5 pound walleyes being caught. The ice was 14 inches in most of the places that they fished.